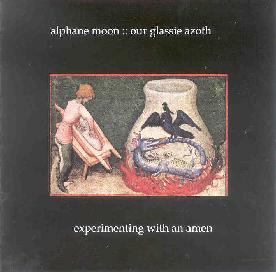 Alphane Moon/Our Glassie Azoth - "Experimenting With An Amen"
Experimenting with an Amen is essentially 70 minutes of sonic disturbance interspersed with some oddly acoustic numbers (almost folksy, though in a decidedly psychedelic vein) that create a shocking contrast to the harsh electronic terrorism that dominates the bulk of this CD. A variety of electronic instruments are employed, resulting in dense waves of feedback, drones, distortion, twisted frequencies and mangled textures. And there are copious tape mutations and manipulations that add further to the bizarre structure of Experimenting with an Amen. The acoustic pieces, such as “Cyngory Biogen,” feature some hash attack inspired lyrics that are somewhat reminiscent of early T. Rex (when they were actually Tyrannosaurus Rex) but the music as a whole bears far more of a resemblance to kraut rockers like Cluster and Faust. Consequently, this isn’t the easiest of albums to fully digest. The purposely fragmented nature of the song sequence (one moment quiet and meditative, the next clangorous and dissonant) is certainly unconventional, though at the same time frustrating, as one is never allowed to really become comfortable with the constantly shifting sound sources that alternately assault and caress the senses. Of course, that’s probably the point. But heady conceptualism aside, the listening experience does require at least some amount of aural safety. Alphane Moon & Our Glassie Azoth would remove that comfort zone entirely. The sound montages are absolutely brutal, and fans of extreme electronic music will no doubt appreciate the group’s forays beyond the boundaries of noise and cacophony. However, be warned: weak hearts need not apply here. For more information you can visit the Oggum Records web site at: http://www.oggum.co.uk. Contact via snail mail c/o Oggum Records; Glynllifon; Pentre Isaf; Tregaron; SY25 6ND; Wales.